For other uses, see In the Ghetto (disambiguation). (1969) "Clean Up Your Own Backyard"
"In the Ghetto" (originally titled "The Vicious Circle") is a song written by Mac Davis and made famous by Elvis Presley, who had a major comeback hit with it in 1969. It was released in 1969 as a 45 rpm single with "Any Day Now" as the flip side. It is a narrative of generational poverty: a boy is born to a mother who already has more children than she can feed in the ghetto of Chicago. The boy grows up hungry, steals and fights, purchases a gun and steals a car, attempts to run, but is shot and killed just as his own child is born. The song implies that the newborn will meet the same fate, continuing the cycle of poverty and violence. The feeling of an inescapable circle is created by the structure of the song, with its simple, stark phrasing; by the repetition of the phrase "in the ghetto" as the close of every fourth line; and finally by the repetition of the first verse's "and his mama cries" just before the beginning and as the close of the last verse. 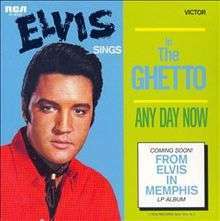 "In the Ghetto" was recorded during Presley's session in the American Sound Studio in Memphis, Tennessee. It was Presley's first creative recording session since the '68 Comeback. Other hits recorded at this session were "Suspicious Minds", "Kentucky Rain", and "Don't Cry Daddy". The song was Presley's first Top 10 hit in the US in four years, peaking at number 3, and his first UK Top 10 hit in three years, peaking at No. 2. It hit No. 1 on Cashbox. It was a number-one hit in West Germany, Ireland, Norway, Australia and New Zealand. As a major international hit, Presley included it in his setlist during his return to live performances at the International Hotel in Las Vegas in 1969. It was a staple of his shows in the first two seasons, however in his third (August/September 1970), he included it only once, at the dinner show on 13 August, for the benefit of the MGM cameras who were filming Elvis: That's the Way It Is (1970). This version started without pause at the end of another hit from 1969 – "Don't Cry Daddy". The song was recorded in 2007 by Lisa Marie Presley as a duet with her father to raise money for the Presley Foundation. The song was released on iTunes. After Elvis Presley, the song has been performed by many other artists. Among them were, most notably, Sammy Davis Jr., Marilyn Manson, Susan Cadogan, Candi Staton, Dolly Parton, Bobby Blue Bland, Bobbie Gentry, Nick Cave and the Bad Seeds, Ian Stuart Donaldson, The Cranberries, Merle Haggard, Leatherface, Three Six Mafia, DNX vs. The Voice, Natalie Merchant, Bad Lieutenant, Fair Warning, Beats International, Eleanor Shanley and Hecchi & Kethmer. The Spanish singer and actor Enrique Castellon Vargas, also known as "El Principe Gitano" (The Gypsy Prince), recorded a Spanish version of the song. The KLF used a sample of the Elvis recording in their ambient DJ album Chill Out (1990). Mac Davis recorded a version of the song for a greatest hits album released in 1979. In 2011, Chris de Burgh covered the song on his album Footsteps 2. Dancehall singer Sister Nancy used some of the song's lyrics in the song "Coward of the Country", which appeared on her 1982 album One, Two. In 2014, cricketer Andrew Flintoff was asked to sing Elvis, as commentator David Lloyd had recommended Flintoff's Elvis impersonation. He proceeded to sing In The Ghetto whilst the game was going on (he was miced up, as part of the entertainment). 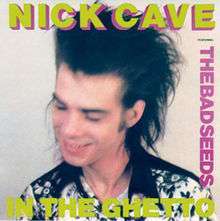 "In the Ghetto" was covered by Nick Cave and the Bad Seeds and was their debut single. It was recorded at the Trident Studios in London and released as a 7" on June 18, 1984 with the B-side "The Moon Is in the Gutter". It reached 84 on the UK Singles Chart. While originally not present on any album, it was later included on the CD reissue of the band's first album, From Her to Eternity. In the Comedy Central show South Park, Eric Cartman sings "In the Ghetto" on two separate occasions, once in "Chickenpox", then again when Kenny's soul is trapped in Cartman's body in "A Ladder to Heaven". Paul Shanklin recorded a parody called "In a Yugo" for Rush Limbaugh, in which an environmentally conscious family buys a Yugo to save gas, only to get killed by a truck after swerving to miss a duck. Later, Shanklin updated his parody for a new generation too young to remember the Yugo, replacing it with its perceived equivalent, "In a Hybrid". El Vez recorded a version titled "En el Barrio" that mixed humor with details about Chicano struggles. Danish Radio group "Selvsving" also recorded a parody called "Ned i NATO", which makes fun of former Danish Prime Minister Anders Fogh Rasmussen's path to a leading post at NATO. The BBC radio comedy programme Radio Active broadcast a version titled Tim the gecko. Dutch TV celebrity and comedian Paul de Leeuw released in 1992 in Dutch language translated version as his alter ego Bob de Rooy. In the Fox sitcom New Girl, Jessica Day sings "In the Ghetto" as an Elvis impersonator at her roommate Nick's father's funeral. ↑ "YouTube". YouTube. Retrieved 2016-10-02. ↑ "Nick Cave Discography on "From The Archives"". From The Archives. Retrieved 2008-06-09. ↑ "Everyhit.com". everyhit.com. Retrieved 2008-06-10. ↑ Lazell, Barry (1997). Indie Hits 1980-1989. Cherry Red Books. Retrieved September 5, 2014. ↑ "MP3 file". Mfile.akamai.com. Retrieved 2016-10-02. "I've Got So Much to Give"
"You See the Trouble with Me"
"Baby, We Better Try to Get It Together"
"Don't Make Me Wait Too Long"
"Oh, What a Night for Dancing"
"Your Sweetness Is My Weakness"
"Sha La La Means I Love You"
"It's Only Love Doing Its Thing"
"Any Fool Can See (You Were Meant for Me)"
"It Ain't Love, Babe (Until You Give It)"
"I Love to Sing the Songs I Sing"
"Don't Let Them Blow Your Mind"
"For Your Love (I'll Do Most Anything)"
"Follow That and See (Where It Leads Y'All)"
"I Wanna Do It Good to Ya"
"Put Me in Your Mix"